You wonder where to find inspiration. Over the last few days, I’ve been focusing on women and issues of midlife women, as part of The Write Tribe Festival of Words. I have showcased some pretty awesome midlife bloggers too. Today I found this brilliant song – which seems to fit in so well with my theme and I just had to share it with you. Enjoy! No matter what age you are, this is the best part of your life – if you see it as such! Gorgeous post!!! It is so true that inspiration has to come from within ourselves. It really is mind over…our own mind. Each and every word fills oneself with positivity. hey thanks for sharing this song. never heard it but kinda loving it. and the lyrics was a great touch! i think sometimes inspiration gets buried under all the other feeling and i can’t feel inspired until i let go of those. lovely post Corinne. Beautiful poem and beautiful song, Corinne. Thanks for sharing and spreading positive energy. It made me good inside reading this fab post. Inspiration, strength, beauty, …. all are within us. Yet, most of us seek these things elsewhere. Even when it comes to tourism, people seek beautiful sights in foreign lands, totally ignoring the equally, if not more beautiful sights that are available in our own country. “No matter what age you are, this is the best part of your life – if you see it as such!” True, only “if you see it as such”! Corinne, it is a pleasure to read your post. 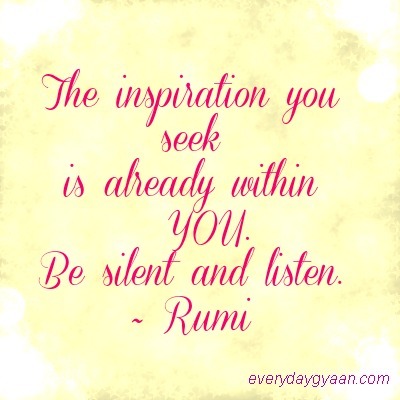 How truly you have said that inspiration comes from within. Hi Corinne – lovely song. Inspiration comes from within and can also come from around us. Good to have a lot of inspirational people in our lives who can cultivate that inner-inspiration:) People inspire. So does nature. And the divine. and that quote by Rumi is simply just right. A wonderful reminder Corinne, thank you for sharing this. That is true, Corinne…wherever you are is the best, whatever age you are at, its is the best…only the perspective needs to be changed. Thanks for this post. And that song is brilliant…heard it for the first time, though…but great! I love how you’ve summed up inspiration – what it means, where we find it – in such a beautiful thought poem! Lovely song…this is truly the best part of our lives!